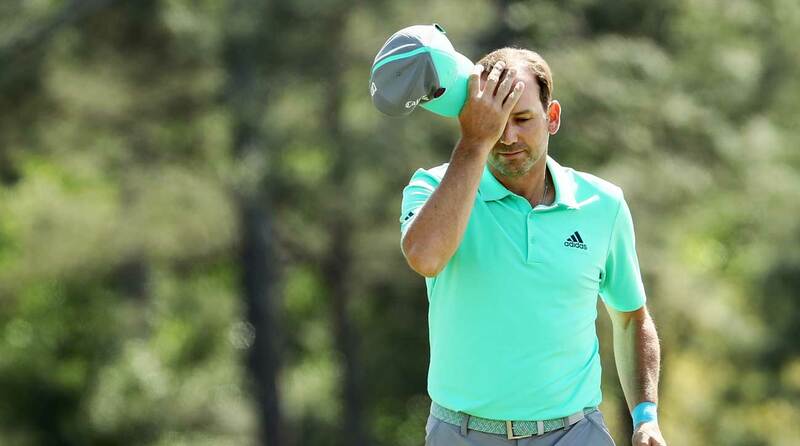 AUGUSTA, Ga. — On Twitter, and in Augusta National's media center, and throughout the internet world, the news spread like mad: Sergio Garcia did what? Jokes were flooding social media before Garcia's fifth Callaway had settled to the bottom of the pond on No. 15. Out on the blissfully iPhone-free grounds of Augusta National, word of the Firethorn Massacre spread the old-fashioned way: slowly at first, then all at once. As Garcia arrived at the 18th green, his updated score appeared on the overlooking leaderboard and the murmurs spread. "What the hell do you mean?" one onlooker asked his in-the-know friend. "Why didn't he just drop it?" "He did!" his buddy responded, near-giddy. "Like, four times." A year ago, this fit the narrative. But now? We were supposed to be done with this part of Sergio's relationship with golf. Garcia-as-victim was a storyline that we thought he'd buried on this very same hole, Augusta National's reachable par-5 15th, with a towering eight-iron and a triumphant eagle one year ago this week. The cliffnotes, if you missed it: after a 322-yard drive down the left-center of the fairway, Garcia hit his second, fourth, sixth, eighth, and 10th shots into the pond (effectively!) guarding the 15th green. (The first water ball was a six-iron, and the next four were wedges from the drop zone.) He then got up-and-down for a 13, tying the highest score ever recorded on any hole at the Masters. His bounce-back birdie on No. 16 was impressive, but did little to counteract the scorecard-destructing octuple-bogey. Reality seemed to be sinking in as the defending Masters champion shook hands with playing partners Doc Redman and Justin Thomas on the final green. Garcia walked, stone-faced and tight-lipped, through the ropes from there, staring down at his scorecard, double-checking or stewing, likely both. Murmurs followed him, as did some oblivious shouts of encouragement, as he headed to the scorer's table. When he emerged, he gave his wife Angela a long embrace, strapped on his watch (sponsors first!) and exhaled as he turned to face the media. "I don't know. I don't know what to tell you. It's one of those things. I feel like — I don't know," he said. "It's the first time in my career where I made a 13 without missing a shot. Simple as that." Did Garcia have a legitimate gripe with the setup of the pin? Perhaps. But his words called to mind Garcia missives of years gone by, words we thought we'd heard the last of. There was defeatist Sergio after the 2012 Masters. "After 12 years I've come to the conclusion that I need to play for second or third place." There was delusional Sergio, after the 2007 British Open: "I'm playing against a lot of guys out there, more than the field." And there was Augusta-hating Sergio, particularly after the event in 2009: "I don't like it, to tell you the truth. I don't think it's fair, and it's just too tricky…they can do whatever they want, that's not my problem. I just come here and play, and then go home, so that's about it." But this was supposed to be a healed relationship. Garcia has a green jacket now, which makes him effectively a member here. He named his freakin' kid after the 13th hole! But the cruelty of golf and perhaps the hard-headedness of Garcia survives and transcends. "Well, you saw it, I don't think I need to describe it," he snapped when asked about the pin position. Then he took a bit of a pause, collecting himself. This is Sergio Garcia, new husband and now father, who we have collectively dubbed a Fulfilled Player and Person. But the guy made a 13 at the Masters — how could he be anything but prickly? He tried to explain, more patiently this time. "It's not the first time it's been there, so it's not new, but with the firmness of the greens and everything, I felt like the ball was going to stop. And unfortunately, for whatever reason, it didn't want to." In the sort of cruel twist Sergio has always noticed so clearly, his amateur playing partner, Redman, hit his ball on the same bank — but Redman's stayed dry, holding up on the very edge. That meant both Redman and his ball had a front row seat to the madness as the water level began to rise beside it, one Callaway at a time. "It was tough," Redman said. "Oh, man, I just wanted one of those to stay up for him, really." Garcia walked by as Redman was finishing his interview, shoulders slumping in his Masters-green shirt, his spikes clacking on the sidewalk. Then he turned left; he headed to the Champions locker room.